The LPF Championship is a professional wrestling championship managed by Lucha Profesional Fronteriza in Mexico and Desert Wrestling Entertainment in the United States. It was introduced in 2014. Arez is the current champion. He defeated Aeroboy on May 13, 2016 in the Sparta Boxing Gym at El Centro, California to win the vacant title. On October 24, 2014 began the 2014 Reyes Del Ring Tournament in order to crown the inaugural LPF Champion. 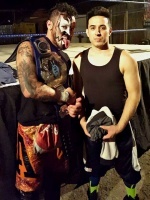 Aeroboy and Rey Horus advanced to the final, wich was scheduled to take place on December 13, 2014 when Aeroboy defeated Rey Horus to become the first champion in the promotion. ↑ Tiburón bet his Rey De Reyes Championship, Triple X Jr. bet his Veracruz Cruiserweight Championship, and Violento Jack bet his DTU Extreme Championship. All they were unable to return to the ring before the referee aplied the count of 20 seconds. All wrestlers retained their respective title. This page was last edited on 20 November 2017, at 00:56.